Cut (2) 5 x 7 inch pieces of contact paper. Peel the backing off one piece and lay on your work surface with the sticky side up. Place little pieces of tissue paper and Sequins onto the sticky paper. Tip: There are leaf shaped spangles inside the package. Peel the backing off the other sheet of contact paper and place sticky side down onto the sheet you just decorated. This will create a sandwich sealing the design together. 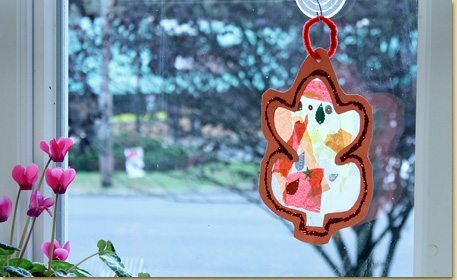 Now you need to create (2) leaf shaped borders for your sun catcher. First, fold a sheet of orange construction paper in half. Then fold in half again. Draw half a leaf shape along the edge of the fold. We created a template for this design which you can download by clicking the “template” button under the picture of this project. Cut out the leaf shape. When you unfold your paper you will have a full leaf “window” in your paper. Open the folded paper and add glue around the leaf all the way to the edges as shown. Place your contact paper art from Step 4 over the glue side of the paper. Add more glue on the leaf shape on the inside of the folded paper and fold it closed. Line glue around the edge of your leaf shape then sprinkle with Red Glitter. Shake excess glitter onto a paper plate. Fold the paper plate in half to pour the extra glitter back into the jar. Cut the construction paper to make a leaf shape, mirroring the shape of the middle leaf. Punch a hole on top. Thread a piece of red Fuzzy Stick through the hole and create a loop for hanging. Use a Suction Cup to place the leaf on your window where the sunshine will shine through the contact paper!